It’s well known that employers get a large bulk of applications and resumes for one simple job posting. Since we are all living in this fine age of advanced technology, most of these applications are received via email. With the high possibility of receiving close to one hundred resumes for a job post, it can become very difficult to weed through all of the job seekers. It may be even more difficult to take the time to click on an added link in an email or resume. However, that link may be leading you to a candidate’s video resume- and that is something you don’t want to miss. Recently, video resumes have become very popular among job seekers as well as human resource managers and employers. In fact, 9 out of 10 employers say they would watch a video resume if it was submitted to them. A video resume is a 60 second to two-minute video max where job seekers can introduce themselves to you outside of the traditional resume format. They can be beneficial to you as employers for many reasons. 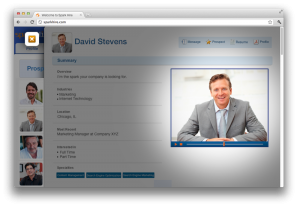 For one, video resumes are extremely easy to review. No one is saying that employers should throw out the traditional, paper resume completely. However, it would be in your best interest to give some time to a candidate’s video resume. After all, since they are only a couple minutes max they won’t cost you any more time. Plus for many, it may be much easier to sit back and watch the video resume of a job seeker instead of reading through a paper resume that offers no sense of personality. Which leads us to our next reason. Traditional resumes offer up a plethora of information- that can’t be denied. You can see a candidate’s work history and the main tasks they executed at each position. However, what paper resumes lack are personality and flair. Sure, a few creative job seekers here and there will try to get some personality across in design or vocabulary, but it’s not enough. With even just a short video resume, employers can pick up on so many different cues that can hip them to whether this candidate will be a great fit or not. This is very important in trying to fit a candidate for company culture. If you can tell right from the get-go from a candidate’s video resume that they won’t fit in with your company culture, you can save tons of time skipping a phone screen, a one-way video interview, and even an in-person interview. As stated earlier, a video resume is usually only a couple minutes long. In fact, when job seekers create a video resume on Spark Hire (known as a Profile Video) it can only be 60 seconds maximum. When they only have about six seconds to grab a hiring manager’s attention with a resume, a video resume can really give you a better idea of who this candidate is. Plus, with only 60 seconds to impress you, you won’t be losing any time at all, but you’ll be gaining a better understanding the candidate. If you are hiring for a position in which the hired candidate will be interacting and conversing with customers or clients, then you will certainly want to get a good feel for their communication skills. Once again, traditional resumes are great but they offer no insight into a candidate’s communication skills. If you take the small amount of time to open up a candidate’s video resume, you can see how well they communicate with others. Plus, if a candidate is willing to include a video resume in their application then it’s likely they are confident in their skills. These are the kinds of people you want interacting with your customers or clients, and you can tell right off the bat if they are what you need. That way, you don’t waste time calling them for a phone screen or waste time having them come into the office for an in-person interview. So there you have it. Video resumes can really aid hiring managers and employers in the hiring process, and can give you a better, fuller picture of the candidates applying for your jobs. So next time you receive a link to a video resume in an application, email or on a traditional resume, take the extra minute or so to watch it. You may be saving yourself tons of time in the process.